File illustration photo shows a Russian rocket. A fragment of a Russian satellite that fell back to Earth after a failed launch crashed into a village in Siberia hitting a house on a street named after cosmonauts, officials said. A fragment of a Russian satellite that crashed into Siberia in the latest setback for Russia's space programme hit a residential house on a street named after cosmonauts, officials said Saturday. 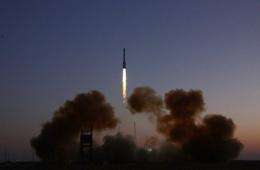 The Meridian communications satellite failed to reach orbit Friday due to a failure with its Soyuz rocket, raising new concerns over the Russian space programme which has now lost over half a dozen satellites in the last year. Its fragments crashed into the Novosibirsk region of central Siberia and were found in the Ordynsk district around 100 kilometres (60 miles) south of the regional capital Novosibirsk. "A sphere was found, around 50 centimetres (20 inches) in diameter, which crashed into the roof of a house in the village of Vagaitsevo" in the Ordynsk district, an official in the local security services told the Interfax news agency. In an extraordinary irony, the official said that the house was located on Cosmonaut Street, named after the heroic spacemen of the Soviet and Russian space programme. There were no reports of casualties while officials said that radiation was within normal limits. The owner of the house Andrei Krivoruchenko, who was at home with his wife at the time, said that he heard a huge noise and a crash as the satellite hit his roof. "I climbed up onto the roof and could not work out what had happened. Then I saw a huge hole in the roof and the metal object," he told Russian state television. The head of the Ordynsk district, Pavel Ivarovksy, told Interfax that the damage was being examined by specialists and the owner of the property would receive compensation. The failure of the Soyuz-2.1B rocket to deliver its payload is a particular worry as it comes from a member of the same family that Russia uses to send multinational manned crews to the International Space Station (ISS). An unmanned Progress supply ship bound for the ISS crashed into Siberia in August after its launch by a Soyuz, forcing the temporary grounding of the rockets and as well as a wholesale re-jig of the station's staffing. The loss of the Meridian satellite caps a disastrous 12 months for Russia that has already seen it lose three navigation satellites, an advanced military satellite, a telecommunications satellite, a probe for Mars as well as the Progress. Russian space agency Roscosmos said the satellite came down due to third stage rocket failure just seven minutes after the launch. "This again shows that the (Russian space) industry is in crisis," admitted Vladimir Popovkin, the head of Roscosmos, in comments broadcast on state television. "It is deeply unpleasant." Acknowledging that the jobs of the Roscosmos leadership were at risk, he added: "I think it is possible that the organisational conclusions will be quite severe, right up to including myself." He blamed the crisis in the Russian space industry on the departure of specialists who quit in the 1990s after the collapse of the Soviet Union. "The main problem is the loss of the personnel who should have come into the industry. People left but did not come in. We need to find a way out of this situation and we will concentrate on young people." The most recent calamity in the Russian space programme was the loss of the Phobos-Grunt probe for Mars's largest moon, which was launched on November 9 but failed to head out of Earth's orbit on its course to the Red Planet. Russian officials have warned that Phobos-Grunt is expected to fall back to Earth in January.
" Cloudy with a 45% chance of space balls "